Mobile phone companies wouldn’t get away with selling the latest wireless handset, which then requires a wire to connect a call. So why do some internet providers get away with selling fibre internet then using copper for part of it? We are seeing and hearing more and more about fibre internet being available to commercial and residential properties. It seems as though everywhere you go you will see a green cabinet somewhere down the road with a big sticker on it saying ‘super-fast fibre now in your area’ or an ISPs (Internet Service Provider) engineer van wrapped in ‘high-speed fibre for your business/home’ graphics. Sounds amazing right?! Unfortunately, in most cases, this is not entirely accurate. In this article, we’re going to take you through what it should really be called and how to look out for it, fake fibre… also known as FTTC. With FTTC internet, the cable from the exchange to the cabinet is fibre optic… then from there to your property, it is standard copper wire, which depending on your distance from the cabinet will actually give you slower speeds than you pay for. Copper wires are also prone to suffer from interference and signal loss mostly recognised as the infamous buffering icon. So before you sign a new contract for your ‘amazingly fast fibre internet’ make sure to check it is not FTTC first! 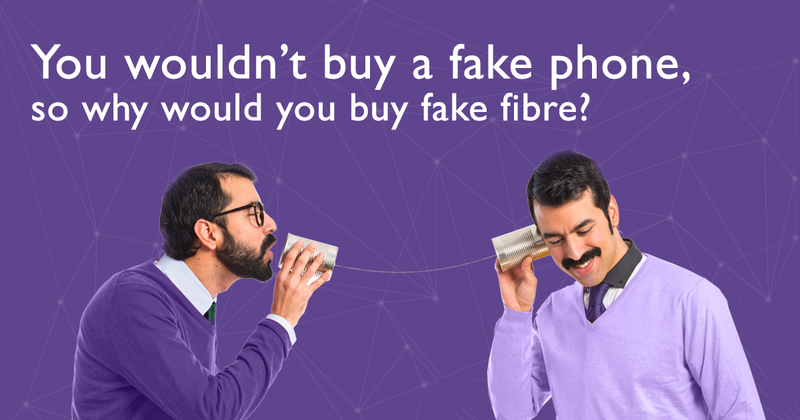 So what is real ‘full-fibre’? FTTP/H is the fastest fibre connection available to residential and commercial customers to date. All the cables that connect from the exchange all the way to your property are fibre optic, meaning a much faster internet connection that will not lose speed and is a lot more reliable – fibre cables do not suffer the signal loss experienced by copper cables and are immune to interference. In most cases, it won’t even run through a cabinet. Consumers of full-fibre are enjoying speeds from 100 Mbps to 1 Gbps and beyond! Does my internet usage warrant a move to full-fibre internet? You have many internet-connected devices (phones, consoles, tablets, laptops, TVs etc.) in the office or at home. You stream HD videos from sites/apps such as Netflix or for training/work purposes. You need to download or send large files quickly and regularly. You use the cloud and other online services to store and retrieve data. You often have web conferences with clients or employees who work from home. You have a VoIP telephone (what’s that?). Bridge Fibre are a well-established internet service provider based in Cambridge who operates nationwide. Delivering our full (not fake) fibre internet to over 30 science and business parks as well as 1,000+ tenants… there’s a reason why we have been dubbed as “the power behind the throne” for our ultra-fast connectivity and flexibility. Because we own our full-fibre network, we are directly involved in its integrity and can provide faster response times and overall support than the likes of Virgin, BT, TalkTalk and the rest!